THE inconvenience caused to bank customers by meltdowns in information technology does not appear to have had an impact on levels of customer satisfaction with the big four banks. Figures from the most recent survey of consumer attitudes by Roy Morgan Research continued on an upward trend of 1.2 per cent in June, with 75 per cent of customers saying they were satisfied with their bank despite a recent spike in system glitches across all four banks. The latest system failure at Westpac, which delayed the processing of payments, was being blamed on a ”corrupt file”. The bank, which has recently embarked on an ambitious, $2 billion computer-system upgrade, insisted yesterday the failure was not a result of any scheduled computer revamp. The latest headache for Westpac customers is one of a long list of upsets for bank customers in recent times. In April, NAB customers were left unable to access their pay after a processing failure. In May, ANZ customers were unable to access their online accounts and, a month later, a technical error prevented Commonwealth Bank customers from using their online banking accounts. The Commonwealth and NAB are undertaking billion-dollar ”core migration” upgrades of their computer systems, and the Commonwealth is well ahead of its rivals. But ANZ, which has more modern core systems than its rivals, recently said it would not invest in major upgrades of its existing computer technology. The upgrades are complex and involve replacing technology that in some cases is decades old, making teething problems like those experienced of late inevitable. So why is that relevant? Well, to me it indicates that for all the sensationalism about service level agreements and uptimes with cloud computing it seems, from the above anyway, that most people are willing to put up with glitches. There seems to be this belief that moving to the cloud should guarantee 100% uptime. If it involves technology and if it involves human beings then there is always going to be the chance of downtime. Much the like the banking systems detailed above, such large system are much more reliable in the cloud but they will never be perfect. Why? Because most customers understand the complexity of these systems and expect issues now and again. Sure, there is a point when enough issues will start impacting their levels of satisfaction but I’d say that if this is the case with banks why won’t it be the same for cloud computing? And why are all these pundits screaming about the unreliability of moving to the cloud? Simple, you get more attention for sensationalism than you do for reality, although reality wins out in the long run. So too will cloud computing. Customers don’t expect it to be perfect but they are happiest when the costs are kept down, which is what moving to the cloud is doing to the cost of technology for most businesses. For that reduction in price most are prepared to tolerate ‘glitches’. Certainly a great read, even more appealing if you are into technology. Mark is well known technology expert who has turned his hand to also writing a novel with great effect. Some of the technical aspects and insights in this book come directly from his experience and skill. The books is easy to read and enjoyable by any audience who enjoys thrillers. I found the first part of the book really engrossing however I felt that this wasn’t quite matched by the the second half. It was at this point that the plot expanded beyond its initial focus to be something that I felt was taking the well trodden path of global terrorism which it possibly did not need to take. Unfortunately, I felt that widening the story to include these aspects moved the book beyond the realm of reality and little and made it feel cliché. Overall it was still page turner as I became in engrossed with learning the conclusion of the events. Even thought the whole plot is plausible I just felt talking it down the path of the ‘war on terror’ didn’t allow it to stand apart from similar books. However, that said, I still highly recommend the book as something reader will enjoy. You’ll probably also enjoy it even more if you are into technology as the quality of subject matter shines through here. It makes a great modern day thriller and I reckon a feature movie can’t be far away. Customer was recently greeted by this nasty looking error when they tried to access their Windows SharePoint v3 Server. My first impression when I saw this was that it didn’t look like a ‘standard’ SharePoint or IIS error. I checked the Central Admin site and that was working as expected. I then proceeded to check the obvious things like the services, IIS site and so on. All working as expected (since the SharePoint Central Administration site was also working). The issue? 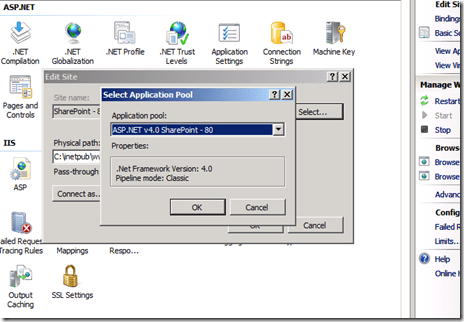 .NET v4.0. 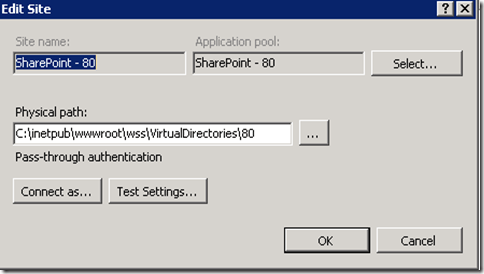 To fix run IIS Manager on the SharePoint Server. 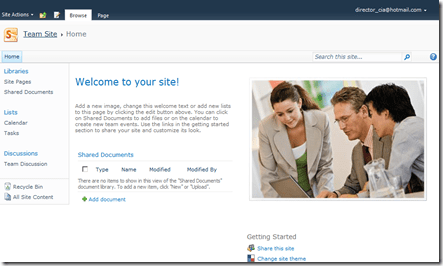 Locate the SharePoint site (under Sites) and click on it. Then on the right select the Basic Settings hyperlink. 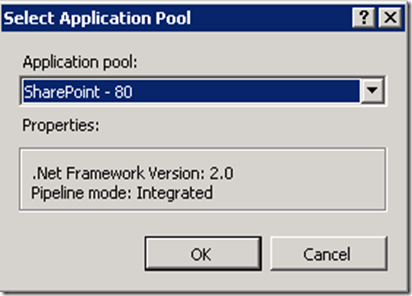 In this case Windows SharePoint Services v3 liked .Net Framework Version 2.0 much better than .Net Framework version 4.0. 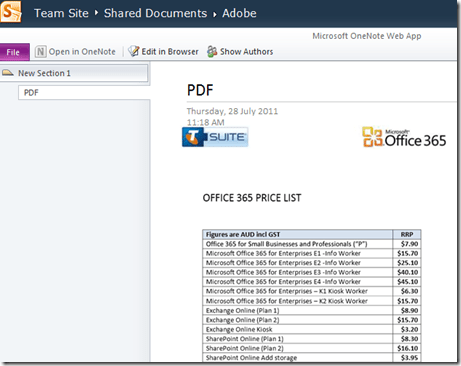 One of the biggest issues I currently see with Office365 SharePoint is the fact that it doesn’t allow you to directly open and view PDF documents in a browser. This has to do with browser file handling on the back end of SharePoint. 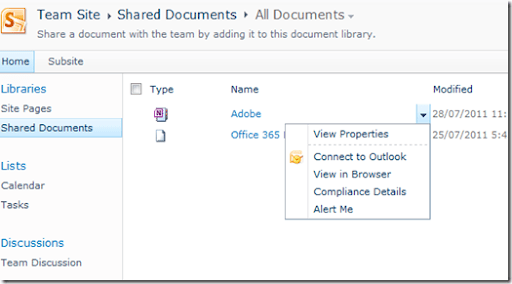 I have previously detailed in my blog how to change that for on site SharePoint but in Office365 you don’t have access to this to make the change. 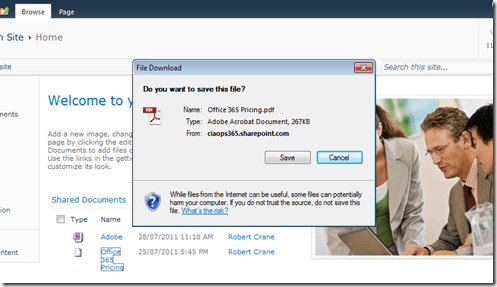 So, if you try and open a PDF stored in Office365 SharePoint you are only given the option to save the file locally. Given how common the PDF format is this is really something Microsoft should change in Office365 as soon as possible as it is causing plenty of people grief (including me). I was faced with just this issue when working recently with a client using Office365 for secure storage and viewing of PDF documents. The solution devised was to use OneNote. When you install OneNote on your system it also installs a Send to OneNote printer on your system. If you print using this printer the output not only ends up in OneNote but it is also indexed for searching (pretty neat). Now if I print that same PDF document into a OneNote file saved on Office365 SharePoint I can click on the OneNote document and view the contents quickly and easily like shown above right in the browser. I agree that this would be a pain if you had lost of PDF documents but at this stage it is the best solution I have found. To my way of thinking this means that because Office Web Apps (viewing) is installed by default with every Office365 SharePoint account people in the Viewers group will automatically see the OneNote file displayed in a browser. However, because Office Web Apps is considered “server rendering” as noted above, they won’t be able to open the file in a local copy of OneNote. As you can see from the above screen shot, firstly, trying to edit the OneNote file in a browser fails as expected as they don’t have write permissions as Viewers. But if you go to the document library and display the properties for the OneNote file you’ll see that there is not the option to save the document locally or open in a local Copy of OneNote. However, it is also important to note that if people can view a document they can always take a copy (even if they take a photo of the screen). The above screen shot shows that they can simply right mouse click on the printed PDF inside the OneNote file and copy and paste it elsewhere. +1, Microsoft please allow PDFs to open directly in the browser OR allow me to make that decision in my setup. – Abraham Lincoln quotes (American 16th US President). I’ve always liked this ‘productivity tip’ from old ‘honest Abe’ but have got to say that I don’t see many people heeding it. On of the things I remember once that someone said about why Bill Gates was so successful was the fact that he woke up every day absolutely petrified that his competition was catching him. This drove him and his business to achieve so much and still be a bell weather of the technology industry it is today ($23 billion profit on $70 billion in revenues). When I look around I see people doing the same old things, the same old ways. I see it many times when you try and help someone understand the potential that SharePoint could bring to their business. Many are simply not prepared (or willing) to invest the time to learn how to potentially do things better (no axe sharpening here mentality). Generally, if you want to do better than what you get paid to work you need to invest your money. The more risk you take, the more potential reward you receive is as true as it’s even been. An intelligent business person works out the minimum risk for the maximum return. Again, I see very little of this out there at the moment. The definition of insanity is doing the same thing yet expecting a different result. So many businesses and individuals I see complete the same processes over and over again without any mind as to how it could be improved. With no mind to how they make it more efficient, they are doomed to make the same mistakes. When asked, they’ll cite the fact that they don’t have enough time. To me this is simply insanity of the highest order because unless you make time you’ll never get time. Simple stuff. I used to be worried about my competition. I used to worried about finding more business opportunities. But from what I can see, someone has left the door to asylum open and many can’t find their way home. I’m happy to help of course, for a fee and that’s just fine by me! 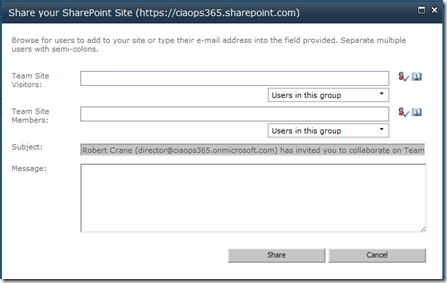 SharePoint on Office365 allows 50 extranet users by default. 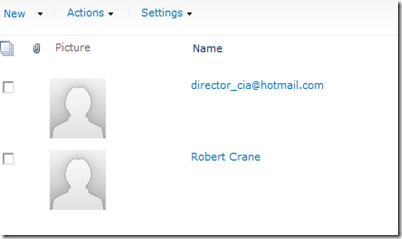 What is an extranet user? 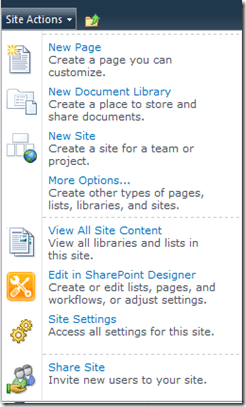 Basically they are users that can that can have access to a SharePoint site (i.e. subsite only) without the need to have an Office365 license, however they are a full user of that site just like a standard Office365 user. The restriction is, that they are limited to accessing just that site. 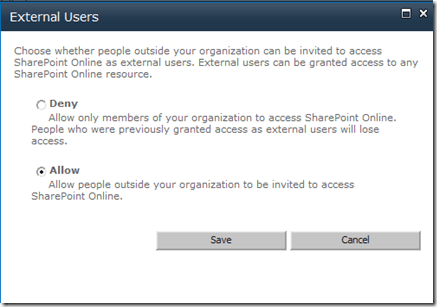 These extranet users are not enabled by default, so the first thing you will need to do after you have created your SharePoint site is to go into the Office365 admin console for SharePoint and select Settings option and then Manage External Users from the sub menu as shown above. You will then need to select the option to Allow as shown above and Save the settings. 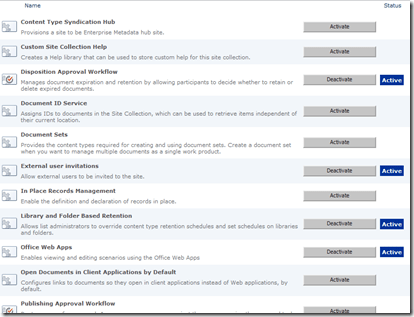 You then need to go into the Site Actions, Site Settings then select Site Collection Features from under the Site Collection Administration section. One of the options is External user invitations as shown above. If that features is not Active then press the Activate button to enable it. To invite an externals user now select Site Actions again and select Share Site from the menu that appears. Now simply enter the email addresses into the desire site groups and press the Share button. If you haven’t correctly enabled Extranet users you will see a message displayed in this box as shown above telling you that “Invitations to users outside your organization are currently disabled”. If so check the above enabling steps. If the invitation is sent successfully you should see a message like that shown above indicating that the users will be added to the site once they accept the invitation. 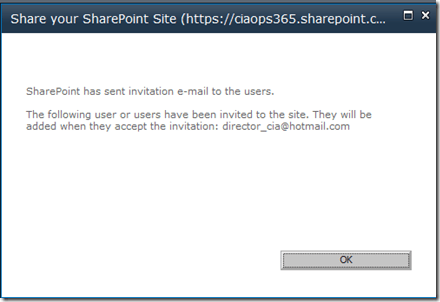 The external user should receive an email like shown above inviting them to join the SharePoint site. The link will take them to a page where they can select to either connect using a Windows Live Id or a standard Office365 login. If the user doesn’t already have a Windows Live Id they will be able to create one via a link shown on the above page. 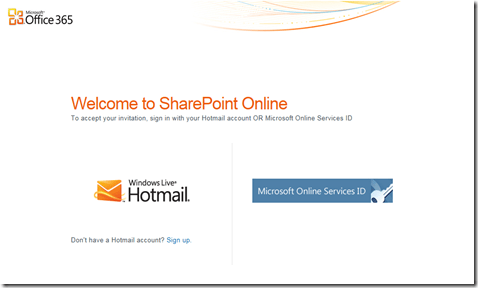 Once they have logged in they will have access to the SharePoint site. If you now look at the securities for that group which you added the external user to you will find them listed by the email address as shown above. They will now be treated as a normal SharePoint user for that site. Can you have more than 50 extranet users? Yes, but you need to purchase an additional license for each one after the first 50 I believe. Any good business tries to do two things. Firstly, it tries to maximize returns and secondly it tries to minimize risk. It is important to note that one can generally never eliminate risk merely minimize it. With that in mind let’s make a comparison of Small Business Server 2011 Standard (SBS) and Office365. The elephant in the room when it comes to ‘cloud computing’ is generally security. However, it is important to keep some perspective here amongst all the pariahs. Most systems today, servers, desktops and mobile devices are connected to the ‘cloud’ and are as such subject to exactly the same risk. However, I would ask as to which systems have more resources dedicated to security and monitoring? An SBS server inside a business or the servers running Office365 maintained my Microsoft? Clearly it would have to be those of Microsoft. Importantly, this doesn’t eliminate the risk of these systems but having servers and systems maintained by Microsoft would certainly reduce the risk to security. When you run an internal SBS system you are totally dependent, normally, on a single Internet connection. If that fails for any reason then your connection to the outside world is severed. I f the same situation happened with Office365 workers could be up and operational again using wireless Internet cards or be allowed to work from home. Thus, there is a much higher dependency on your Internet connection if you select to run an on site network like SBS. With Office365 people can work where ever they have Internet connectivity, whether that be in your offices, at home, at a local coffee shop, the airport lounge or wherever. Another reason cited by many for desiring on site servers is because they ‘know where their data is’. If that is important to your business then that is what you should do but let me give you another real world analogy so we can look at this in perspective. Is it possible for you to ask your bank to see your money? I doubt it. We all trust the modern banking system, that whizzes money around the globe in ones and zeros, to store this valuable resource. Trusting our money to banks provides a significant amount of benefit doesn’t it? It allows up to withdraw cash fro any ATM in the world. IT allows us to pay our bills from the privacy and comfort of our own homes any time we like. It provides us to a range of financial services that once was only the domain of the well to do. Sure you can keep all your money at home (on-site) but that makes things so much harder that for most people it isn’t really worth considering is it? Most people appreciate the significant amount of benefit they receive, with minimal risk, for utilizing a bank so why is you data any different? Following along with this analogy, most people still retain some cash locally for convenience and so it can be the same with data. The cloud is not an all or nothing strategy, especially in the Microsoft realm. Given some of the larger sizes of files and information in makes more sense to consider a hybrid strategy for your technology needs. We all know that bandwidth is not the same everywhere we go, however we all know that it is not getting slower. The SBS family is not limited merely to SBS Standard there is also SBS Essentials which is an onsite server that integrates closely with Office365, providing on site storage as well as access to all the features and functionality that Office365 provides. It is possible to do with the more onsite based SBS Standard system but if you have Office365 doing all the heavy lifting for Exchange, SharePoint, etc why would you need to replicate those features on site as SBS Standard does? Importantly, in comparison between two potential offerings we should consider the feature sets. 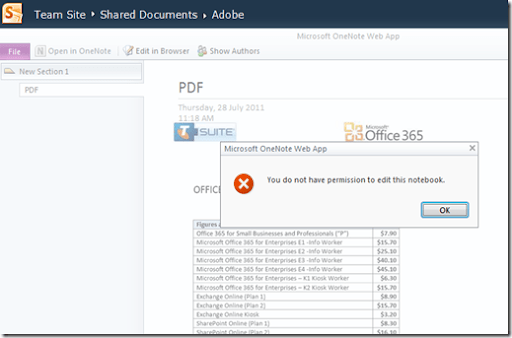 Now Office365 doesn’t claim to do everything that SBS 2011 Standard does. Things such as SQL, patch management and third party applications are not currently handled by Office365 however that doesn’t mean there isn’t other options (especially from the fast developing Windows InTune for example). However, when you consider the core products such as Exchange for email and SharePoint for collaboration the biggest difference is the products that come with Office365 are the enterprise versions and importantly they are available from a single license. SBS 2011 Standard by comparison only contains the Standard editions of products like Exchange and SharePoint which lack features like legal hold and form services. 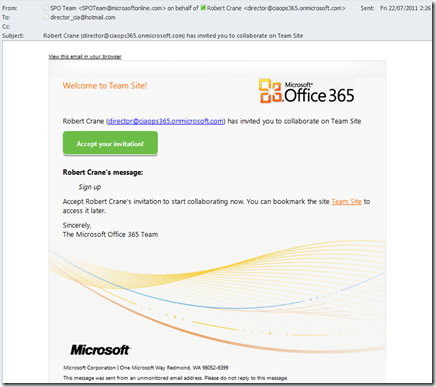 Again, it seems to demonstrate that Office365 is offering more benefits than SBS 2011 standard. In today’s business environment flexibility to meet changing conditions and competition is important. SBS 2011 Standard requires a significant up front cost to implement and then continued ongoing maintenance. This means if you implement this and your business started to grow dramatically you’d have to invest more to scale up. Office365 by contrast (especially the enterprise SKU’s) provide a far more flexible solution. If you only need 5 licenses this month, that’s all you need to pay for. If however you need 10 next month you can scale up. If a certain group of users don’t need all the power of Exchange then you can allow them to use the reduced functionality and costs of the kiosk workers licenses. With Office365 all you need to worry about is what features individual needs rather than guessing what features your whole business may need and being somewhat limited to that after the fact. Unless you are an IT business your aim should be minimize the amount money that you spend on technology to provide you with business advantage. It means you also want the most flexibility and greatest range of features for your investment and on balance one would have to conclude that Office365 fits this bill much better than traditional on premises SBS. This doesn’t mean that Office365 is the solution for all businesses and it doesn’t mean that there things that Office365 can’t do. What it does mean is that Office365 should be taken seriously as an option for even the small businesses that once only considered on site servers like SBS. Every business need to make its own decisions about risk and reward in regards to what works best for them, however the important thing is to these decisions based on solid information not the opinions of a vocal minority.